Like many of you, I am part of the IT team and in charge of driving the business intelligence and analytics strategy for my organization. I just happen to do it at Tableau. And in leading our transformation to governed self-service analytics, my team and I’ve experienced some of the same challenges you face. When we started the analytics team at Tableau, we were asked to produce dashboards for people. We were good at it. But any good dashboard asks more questions than it answers, and the business kept asking for more dashboards. We found we could never match the required speed of the business with our ability to provide answers. Something had to give. And that wasn’t asking the organization to ask fewer questions; we were giving the business the wrong thing! Instead of giving the business answers, we needed to enable the business with trusted data so they could discover the answers themselves. Many of our enterprise IT customers have had a similar journey as they’ve built a culture of analytics within their organizations. And they tell us the journey has dramatically changed the way they’re perceived in the company. They became leaders of using governed data to support decisions. They became the hub of their data-driven wheel. 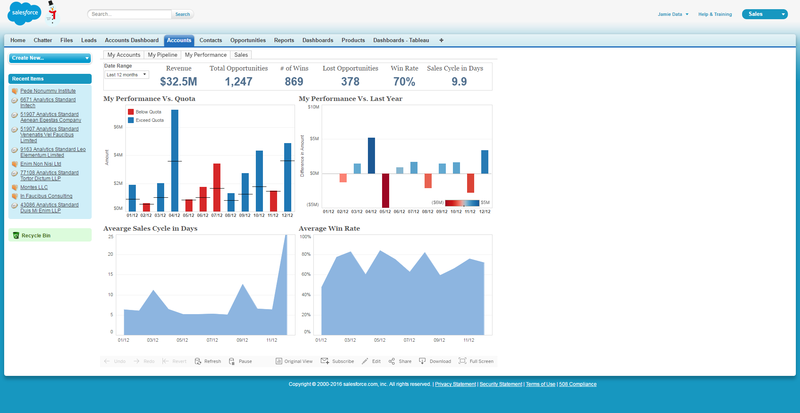 We are committed to making Tableau the enterprise-grade analytics platform your company can rely on. As we shared at TC16, we have current and planned capabilities that help you address these requirements. For data stewards, providing data can be uncomfortable, but doing it securely and accurately helps mitigate risk. 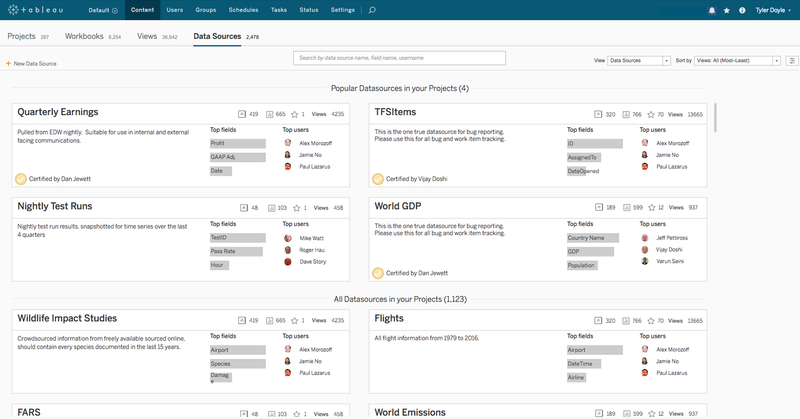 Tableau’s Data Server is your answer to setting up an environment built on trusted data. Built into our Tableau Server and Tableau Online products, Data Server allows you to create and share data models, centralize access, and manage extract refreshes. We’ve been investing heavily in Data Server since we introduced it five years ago. And we have enhancements planned to help you answer two critical questions: Are my users using the right data? And how are people using that data? To help people find the right data, we’ll add endorsements to indicate certified data sources from people you trust. We’ll also introduce a data source home page where users can find a list of all the fields in the data sources, complete with their folders and hierarchies. To help IT admins monitor how people are using the data, we’ll provide deeper usage analytics to help you provide governance. 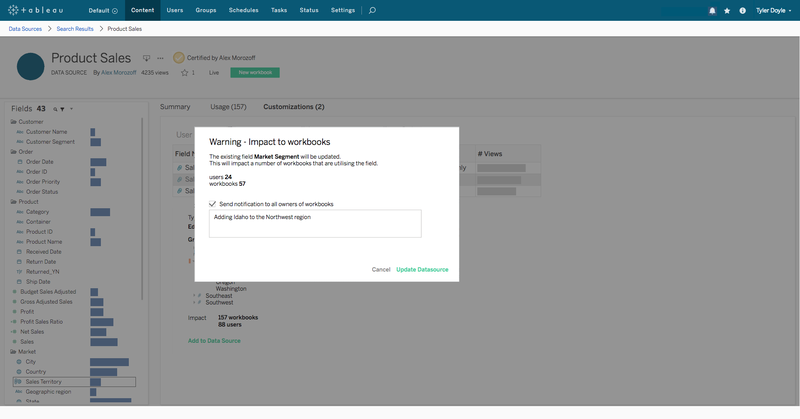 And impact analysis will show you how changes to a governed data source would affect users and workbooks before you make the change. We know how vital it is to keep your data from falling into the wrong hands. That’s why we approach security from many fronts. You can currently authenticate to Tableau Server via Active Directory, SAML, Kerberos, trusted tickets, and client certifications. And soon, we’ll add LDAP to that list. We have several tools to help you manage authorization with the flexibility and control you expect. You can set granular permissions at the levels of workbooks, data sources, and projects. And you can easily lock permissions at the project level, ensuring that only those with proper authorization can access the content within. If you have particularly sensitive data, you can easily audit who has accessed which data using our built-in admin views or your custom-built views. If you have row-level security built into your data and access it via a live connection, we will automatically inherit these permissions and apply them when users access data. If you haven’t defined row-level security on the data source, you can add them in Tableau using the entitlement table. Soon, you’ll be able to publish and share this table in Tableau Server as a Tableau data source. To help you keep your systems secure, we’ve put together a hardening guide of recommended configurations and best practices. The guide aims to help you set your access controls to just the right levels for your organization. Once you’ve secured your data and system, you’re ready to scale seamlessly. 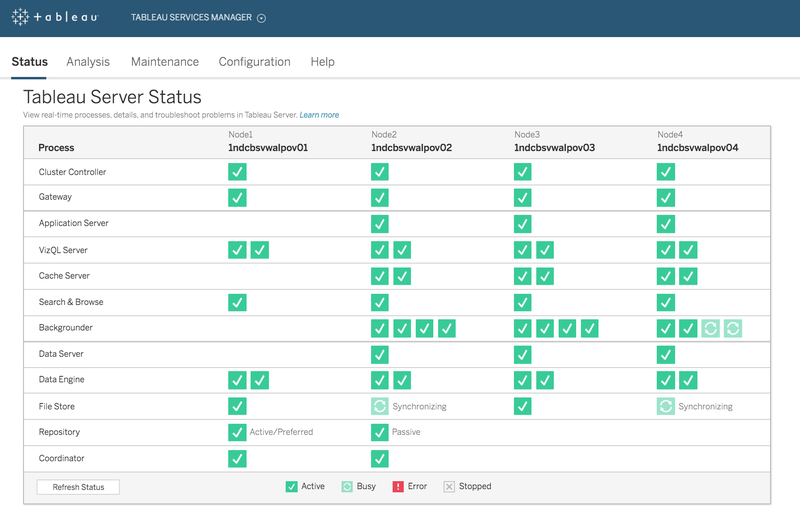 To help you manage and scale, we’re building Tableau Services Manager, a comprehensive tool for analyzing, monitoring, and managing Tableau Server. No more remote desktops to perform maintenance or make changes. IT admins will have a one-stop shop, complete with a beautiful web-based application, REST APIs, and a command-line interface. With this new tool, you’ll be able to make simple topology and configuration changes with no downtime. You’ll also be able to automate tasks using bash or Powershell and integrate with deployment tools like Puppet or Chef. 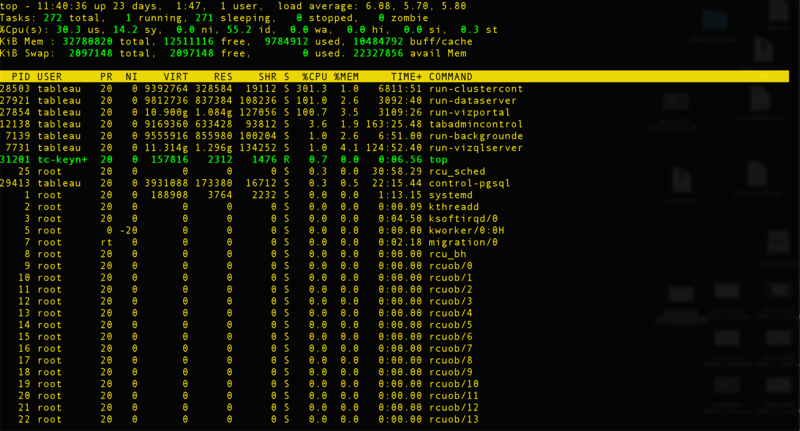 And in the future, you’ll even be able to automatically scale up and down an entire server cluster. With Tableau Server, you have the flexibility to deploy on-premises, in the cloud, or on a hybrid infrastructure. Tableau Server is already supported on all three major cloud platforms, namely Amazon Web Services, Microsoft Azure, and Google Cloud Platform. But we are taking it one step further by integrating deeply with native cloud services on these platforms. Soon, you’ll be able to store your backups in a reliable, low-cost cloud-storage service like Amazon S3. You’ll be able to replace the built-in Postgres repository with Amazon RDS Postgres, giving you superior reliability and scalability as you pay only for what you use. You’ll be able to manage Tableau Server as you would all your cloud resources using AWS CloudWatch. And we’ll deliver sample AWS CloudFormation templates with best practices to make it easy for you to deploy and configure Tableau Server securely in a cloud environment. We’re starting with AWS, and we will bring you deeper integration to other platforms in the future. And soon you’ll also have your choice of operating systems. You’ll be able to deploy Tableau Server on Windows or Linux. We know that many of you rely on Linux to run your enterprise deployments, and we’re working to make your deployment even more flexible. Now that you’ve built a scalable, trusted, and secure environment, it’s time to extend that environment by embedding Tableau. You can integrate Tableau with the rest of your ecosystem to serve up dashboards right where your users want them. Check out our Developer Portal to get access to all of our APIs, documentations, and samples. We know that analytics deployed at scale can truly transform an organization. That’s why we’re building tools to secure your data, manage your analytics deployment, and integrate analytics right into your enterprise application. But let me level with you. What I am asking you to do is hard. What I am asking you to do takes courage. Leading this transition from answers to enablement through governed data leads to a more productive and more engaged end-user community. I want you to go back to your companies and identify areas where you can help lead this transition. If the change isn’t led by us in IT, who will lead it? Continue the conversation on our Tableau Server & Tableau Online Admin Community Forum.